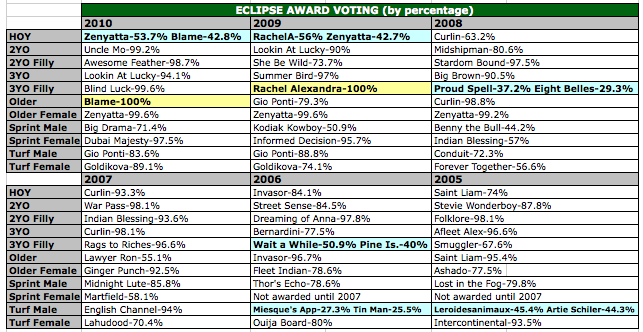 After looking carefully at the Eclipse Award voting for the past six years a lot of interesting questions arose. Read the rest of the article at HorseRacingNation.com. The Thoroughbred Racing Associations’ website says that, “The Eclipse Awards are presented annually to recognize those horses and individuals whose outstanding achievements have earned them the title of Champion in their respective categories.” There are no specific guidelines for the selection of the winners, thus there is a plenty of room for debate about which horses deserve the year-end honors. Every year following the Breeders’ Cup there is two months of debate about the Eclipse Awards. Yet in the past six years there have only been a few categories that actually have ended in a truly close vote. Even the last two Horse of the Year debates, that have focused on Zenyatta, did not end in close votes. In 2010, Zenyatta won HOTY by a margin of 10.9% and in 2009, Rachel Alexandra prevailed by 13.3%. This entry was posted in Eclipse Awards, Horse Racing Nation. Bookmark the permalink.